McKesson and Change Healthcare Holdings (the former Emdeon) complete the creation of the new health IT company Change Healthcare, which combines CHC’s software and analytics business with most of McKesson Technology Solutions. McKesson will own 70 percent of the 15,000-employee Change Healthcare. 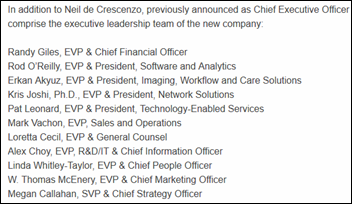 The company’s leadership team is listed above. From Alhambra: “Re: EClinicalWorks. The only tool available for EP MU attestation is the MAQ dashboard, which contains a disclaimer that all users must accept when they first log in. ONC is aware and investigating since a certified EHR must be able to accurately produce the required attestation reports.” Unverified as to the ONC part, but above are the screen shots provided. 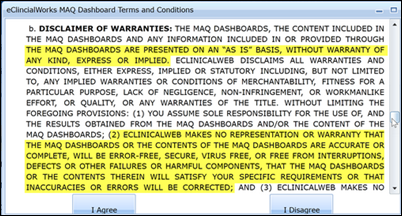 I’m not sure requiring acknowledgement of a standard lawyer-verbose warranty either absolves responsibility to ONC or suggests a lack of capability, so I suppose the issue is who is liable if an incorrect attestation is filed because of flawed data and whether the disclaimer is binding either way. From Studiously Stoic: “Re: Becker’s Healthcare ‘150 Great Places to Work.’ We won and would like it mentioned.” I should stop being surprised when an organization that wins an award fails to note the worthlessness of their “win.” Becker’s employed no reasonable methodology to come with its click-baiting list – it accepts nominations, but then just lets its “editorial team” (mostly of them recent liberal arts graduates) make up the 150 winners based on unstated criteria that doesn’t seem to involve any research beyond Googling. It’s not like they actually surveyed employees or anything. This is not newsworthy. 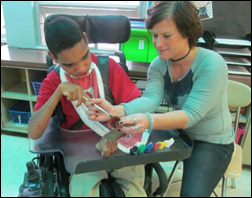 We provided a greenhouse and gardening kits for Mrs. M’s class of severally mentally and physically disabled students in Ohio. The students are actively participating and will present their work to their families in May and can then take the seedlings home to transplant them into their own gardens. I’m annoyed at companies whose marketing people declare that their unchanged software has suddenly transformed into “artificial intelligence” just because it sounds cooler. AI is defined as a device that perceives and reacts to its environment in mimicking human reasoning in performing a complex, nuanced task such as solving a problem and then learning from the process to get smarter. Today’s version of AI is primitive, incapable of doing even a fraction of the intellectual processing of a not-very-bright human even when limited to a super-specialized task in a closed context. I suspect that most AI systems have a “man behind the curtain” who carefully programs the system to appear smart when it’s really not, hoping to find a profitable problem to solve without anyone digging too deeply into the methods involved. This week on HIStalk Practice: The Vancouver Clinic adds ActX genomic decision support. Drchrono opens its second office. CMS begins $100 million spend on helping small practices make the QPP switch. Jacksonville Children’s & Multispecialty Clinic selects PatientPay billing. The CMS Innovation Center looks for input on new pediatric care delivery models. Austin Regional Clinic adds Wolters Kluwer clinical guidelines to its Epic EHR. Coordinated care tech startup CrossTx raises $735k. Culbert Healthcare Solutions Executive Consultant Randall Shulkin shares value-based reimbursement success factors for medical groups. 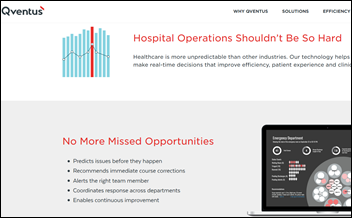 AnalyticsMD changes its name to Qventus. 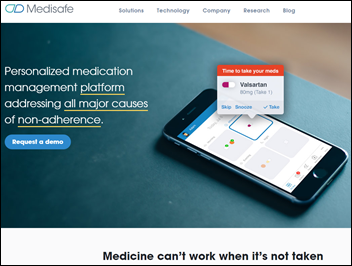 Consumer medication reminder free app vendor Medisafe, which apparently makes money by charging drug companies to nudge their patients into profitably taking all their ordered doses, raises $14.5 million. Tech-powered insurer Oscar, which offers exchange medical insurance policies in four states, loses $200 million in 2016. The company hopes to survive by raising prices, narrowing networks, and selling small business insurance plans to reduce its reliance on the volatile individual market. The DoD chooses BD’s Pyxis ES automated dispensing cabinet for its 115 inpatient facilities and pharmacies in a $100 million contract award. BD acquired the former Carefusion – which offered Pyxis dispensing technology, Alaris smart IV pumps, MedMined surveillance software, and medical supplies — for $12.2 billion in 2014. CVS Health will extend its use of Epic to its specialty pharmacy, which will join CVS’s MinuteClinic as an Epic user. In England, three Liverpool trusts choose InterSystems TrackCare in a deal worth up to $86 million. Signet Accel names co-founder Peter Embi, MD, MS as chief medical officer. He remains president and CEO of the Regenstrief Institute. A federal grand jury in Texas indicts 16 people for fraudulently billing Medicare $60 million for hospice care. In addition to paying kickbacks disguised as medical director salaries and submitting false claims, the company’s CPA owner and nurses made medical decisions based on what paid the most, including placing patients on high-dose narcotics regardless of their need. The medical directors also gave their EHR log-in credentials to others to create and sign orders for services that were billed but not performed. 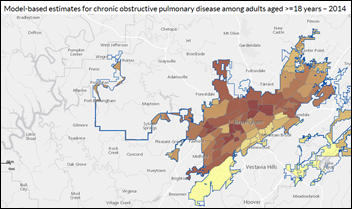 CDC publishes the 500 Cities Project, which allows visually comparing and downloading the prevalence of 27 chronic health condition measures between cities and down to the census tract level in a chosen city. Facebook is testing algorithms that can identify users who are having potentially suicidal thoughts, after which a company team will rapidly review the user’s posts and comments from friends and then send a message offering resources. Facebook is trying to balance its response to such incidents against the privacy issues that would arise if it automatically notified family, friends, or mental health groups without the user’s permission. 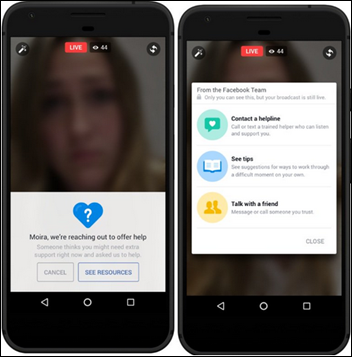 It already allows users to manually flag suicidal posts, functionality that has now been added to Facebook Live streaming video. Facebook says it was working on the tools before a series of events in which people live streamed their suicides on Facebook Live, often with the encouragement of other Facebook users. Amazon Web Services explains its four-hour East Coast outage on Tuesday: a script being run by a technician to take down a few problematic servers contained a typo that instead took a bunch of servers offline, including the one that indexes all locations for running database commands. AWS says it has updated the script tool to disallow taking servers offline if any subsystem will fall below its minimum capacity. It will also speed up an existing project to improve recovery time of the indexing subsystem. NHS auditors find a hospital’s foreign doctor with poor English proficiency looking up medical terms on Google. The hospital says the doctor no longer works there and it will now require language checks. 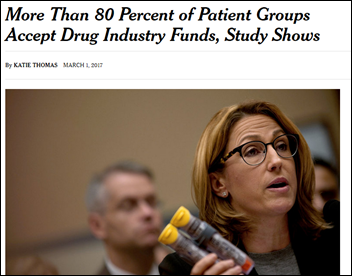 A study finds that 80 percent of patient advocacy groups accept money from drug and medical device companies that sell products to people with the conditions they support, raising the question of whether the donations influence the frequent silence of those groups about drug prices. Some groups receive more than half of their funds from industry, while 40 percent of them have industry executives as board members. Even the umbrella group for patient advocacy groups took in 62 percent of its $3.5 million budget from industry. The groups claim such donations don’t affect their decisions, but the authors recommend that they be required to provide full disclosure. A study confirms what we all suspect and fear – people are indeed peeing in public swimming pools and hot tubs, with an analysis of artificial sweetener content in two pools suggesting they contain from 8 to 20 gallons of urine. Hot tubs had much higher urine levels. 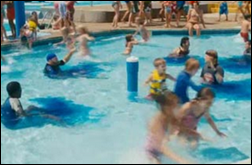 Movie gags to the contrary, no blue dye exists to call out the pee-pertrators. Medicity launches Community Interchange, which creates a single, de-duplicated, and normalized CCD for hospitals. CommonWell TV interviews LifeImage CTO Janak Joshi. Children’s Mercy Kansas City (KS) goes live on GetWellNetwork. MedData will exhibit at HFMA Utah’s Spring Alliance Meeting March 8-10 in St. George. National Decision Support Company will integrate its CareSelect decision support system with McKesson and Meditech. The company also announces that its client base has increased to 250 provider systems and 2,000 facilities in all 50 states. NVoq will exhibit at the CHA Rural Health and Hospitals Conference March 8-10 in Denver. Recondo Technology releases a revenue cycle API for prior authorization, eligibility, medical necessity, and pre-service patient collection and related RCM processes. NTT Data and Oracle expand their existing relationship, adding cloud capabilities to Oracle’s Healthcare Foundation analytics platform. Netsmart extends its behavioral population health solutions to post-acute providers. Orion Health begins migration of its Amadeus precision medicine platform to Amazon Web Services. CloudWave chooses Commvault to power its backup-as-a-service healthcare offering. Definitive Healthcare launches a professional services team to help customers use its healthcare data to understand the market and executive plans. Obix Perinatal Data System will exhibit at the March of Dimes Perinatal Nursing Conference March 6-7 in Lombard, IL. Medicomp Systems announces Quippe Clinical Lens, a web-based, problem-oriented clinician view of relevant clinical information from EHRs and HIEs. Experian Health will exhibit at the FL AAHAM meeting March 8-10 in Palm Coast, FL. Uniphy Health releases UH4, an enterprise collaboration platform that supports patient-centric communications and provides real-time patient data at the point of care. 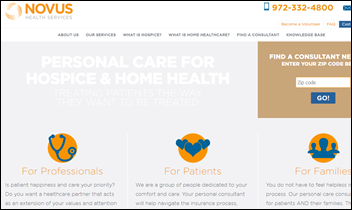 Kyruus integrates ProviderMatch with Salesforce Health CLoud. PokitDok joins the AWS Marketplace, becoming an APN advanced technology partner. 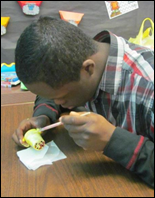 QuadraMed will exhibit at the ANA Annual Conference March 8-9 in Tampa, FL. 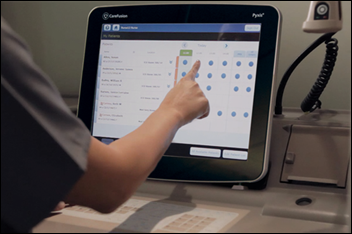 Imprivata integrates its PatientSecure positive patient ID solution with registration kiosks from CTS, Vecna, and PatientWorks. The SSI Group will exhibit at the HFMA Region 5 Dixie Institute March 9 in Savannah, GA. The Surescripts National Record Locator Service is live at 14 health systems nationwide. Best news I’ve heard all day! Thank you! All of a sudden my inbox is filled with spam from “Becker”. Worthless to me, I’m blocking it all.